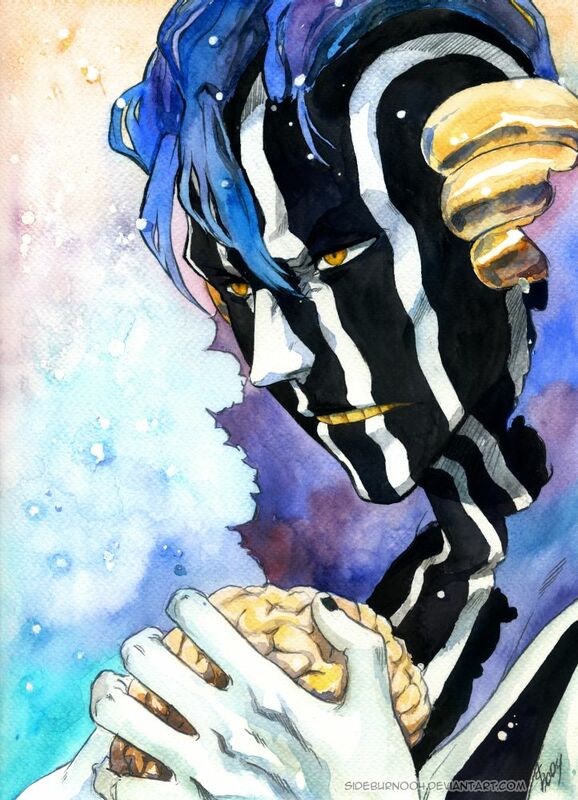 After the last few chapters of Bleach, Captain Mayuri Kurotsuchi fought against the Quincy known as Pernida, who began with its strange form to reveal into the Soul King’s left arm. While showing some trouble during his fight with Pernida, Nemu (or Nemuri) steps in to help out, however Pernida’s power quickly destroys her body but leads to its own demise. All while Mayuri takes whats left of Nemuri’s Cerebrum while he gets into a pod, within it begins his never-ending dream. This fantastic looking artwork was done by Sideburn004, whose art has been featured on here quite a few times. If you like this artwork, be sure to go on ahead and check them out. Otherwise be sure to comment below or share this post with other Bleach and Mayuri fans. Even though I’m kinda annoyed that Mayuri didn’t die like l thought he would, at least he is out of the battle for good. And he did need Nemu’s help. In fact, he shouldn’t even be credited for winning the fight against Pernida, Nemu was the one that won. Really amazing artwork. Agreed, I guess its not his job to bring her back from the death and state she is in. I’m sure she’ll be back soon. I guess youre kind of right, she won the battle, he didn’t do a lot here. I did have a slim hope that when Mayuri entered in this sleep that he’s dying, but now I have my doubts. But I do love the art. Mayuri’s appearance is always unique. The one thing I really like about his look is his hair. It’s damn unique and pretty crazy looking. Yeah it seems your right, wow. Didn’t even know this haha. Googled and found this: Konjiki may also refer to the Buddhist deity Manjusri, who is associated with the “pure lands”, also known as the “golden lands”. Manjusri is one of the Four Great Bodhisattva, along with Ksitigarbha (Jizō). Wow that’s so cool. I mean Ashisogi Jizo does mean leg cutting Jizo. And Ya the Bankai does mean Golden leg cutting Jizo. It also makes sense that it protects children because Mayuri created his Bankai with the 3rd Nemuri project results.